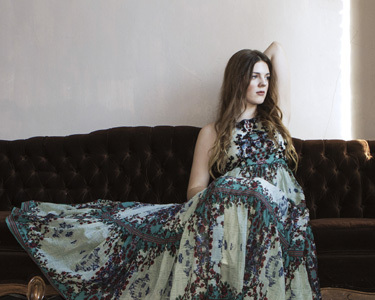 Emily Keener is a seventeen-year-old singer/songwriter from Wakeman, OH. Since her exciting journey into the Top 12 on NBC’s The Voice, Emily has been writing and recording diligently in an effort to capture the energy of this most transformative year. Emily started playing the guitar when she was 11 years old and began writing songs when she was almost 12. A natural curiosity and passion for music quickly got her performing frequently and writing constantly. Almost 6 years later, she has written over 100 original songs and released four EPs and two LPs. Her songs are distinctly original, and the ideas she manages to express in them belie a soul that seems to be much older than seventeen. Before training with renowned vocal coach, Joan Ellison and master guitarist, Tony Schaffer, Emily was entirely self-taught and thrived on the time she spent locked away with a guitar and a notebook. With the guidance and support of her family and friends, fellow musicians, and many zealous music-lovers, she continued to grow in and experiment with her artistry. At 15, she recorded East of the Sun; an original EP backed by the amazing musicians of Norwalk, OH that once made up “The Womacks”. A year later, she suddenly found herself in front of millions of people on national television with her astonishingly well-received debut on Season 10 of The Voice. She had the honor of performing the songs of some of her greatest inspirations, including “Goodbye Yellow Brick Road” by Elton John, “Big Yellow Taxi” by Joni Mitchell, “Still Crazy After All These Years” by Paul Simon, and “Lilac Wine” by Jeff Buckley. After advancing to the Top 12, Emily arrived home with a newfound sense of self as she walked directly from the plane into the studio at Waveburner Recording. Now, a few months later, she is ready to unveil her latest work and prove that this year is just the beginning. Wakeman, OH – Since her well-received appearance on NBC’s The Voice, singer-songwriter Emily Keener has been busy working on her new album, Breakfast. The fresh, modern pop album is laced with folk influences, and beautifully composed featuring Keener’s pure vocals over unconventional melodies and soft futuristic sounds. Breakfast is now available for download on iTunes and streaming on Spotify. Produced by Noah Heyman (The Womacks) and Dalton Brand, Breakfast is a beautiful compilation of Keener’s most precious stories that are both quirky and straightforward. The first single off of the album, “Elevator,” captures the feelings of young love and the struggles that come with finding yourself in it. The accompanying music video uses subtle imagery to portray these feelings in a beautifully visual way. “Light & Sound” is the captivating and complex second single that stands out, layered with gorgeous melodies exuding a cool, soothing vibe. Keener prides herself in writing honest and emotional lyrics rooted in simplicity; with a versatile voice that has a way of being bright and clear in one moment, and dark and sultry in another. Many of the songs on Breakfast have stemmed from personal experiences and that is just how she likes it. “This record is the result of the most intense and transformative year of my life,” comments Keener. “After the crazy journey I experienced on The Voice, I’m so ready for my original music to have the spotlight.” The young artist is known for her old soul, as she says her inspiration comes from artists like Norah Jones, Joni Mitchell, Paul Simon and Jeff Buckley. At a young age, Ohio native Emily Keener fully immersed herself in music. At eleven years old, Keener began writing original songs and learning to play guitar. Now at seventeen, she has written over 100 songs and released three EPs and one LP. Her songs are distinctly original, and the ideas she manages to express in them belie a soul that seems to be much older. After releasing her third EP, East of the Sun, Keener made her remarkable debut on Season 10 of The Voice, singing on national television in front of millions of people. After advancing to the Top 12, Keener left the show and gained a newfound sense of self. With the release of Breakfast and music video for the single, “Elevator,” Keener is excited to prove to the world her career is only just getting started. The album is now available on iTunes and Spotify, and you can watch the video on YouTube. Keep up to date with her exciting journey by visiting EmilyKeener.com.